Check out what you have on hand for clean up and salvage, then make a list of other supplies and equipment you’ll need to borrow/purchase; this will be a time saver so you can keep work flowing smoothly. 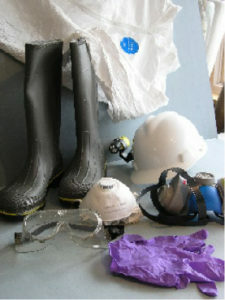 Having the right protective gear and sanitary supplies for you and those helping you are paramount to working safely! View the “Protect Yourself!” PPE video. Nylon string and plastic clothes pins to hang photos and slides (by the corners), CD and durable papers, prints, etc. 100% polyester batting for stuffing out textiles or putting under painting for support as it dries face up. Wax paper, parchment paper or freezer paper for preparing book covers, artworks or photos for freezing. Unprinted newsprint or large roll of plain white paper to cover salvage tables and work surfaces.